My ex flatmate and world music lover used to say “I first heard of him at Womad festival” whenever I was asking her about the music she is listening to, and with that in mind I always start my trip to one of the greatest festivals in the world. Stepping out of the car and entering the festival grounds, you are immediately aware that you have been transported into a “cool” place. Queuing to get your wristband you can hear happy banter in a great range of different languages. Conversations are overheard (call me noisy) from friends reuniting, and travel distances discussed- from as far as US, Spain, as well as all over the UK- travellers. The smile is universal and this crowd is ready to party. WOMAD is one of the biggest festivals we have ever been to however walking around is easy, there are two clear parts we always spend the most of the time, the first is the Arboretum a green tree filled area that rarely gets muddy and houses the World of Wellbeing, plus the Yalumba Taste the World stage follow by The Molly’s bar which comes with a Stage. The second part is the arena, accessible via wristband checkpoints it is home to the main Outdoor Stage, the vast tented Siam Tent, BBC Radio 3 The Charlie Gillett Stage, World Rhythms Stage, Bowers & Wilkins Sound System, the Big Red Tent, and The Disco Bear. It’s also home to the Steamfair, most of the food stalls, good causes, shops, toilet blocks, water taps, the three main bars, public seating, and those fluttering flags. With over 200 performances by 90 artists from 49 countries is hard to decide who to see or I would say discover, thanks to the Womad guide this was easier and we soon realised that two artists we couldn’t miss were Baaba Maal (No words to describe him) and George Clinton. The Senegalese artist who returned to Womad after a 5 -year absence, dressed in a beautiful silk blue full-length dashiki, presented his latest album “The Traveller”, a mix of traditional Senegalese music and pop, with a lot of really uplifting beats and feel-good melodies. Baaba Maal gathered one of the biggest crowds of the weekend, he was given a very warm welcome from Womad Festival goers, and got the crowd moving. George Clinton Parliament Funkadelic gave a furiously funky performance on Saturday; on top of the usual bass and drums there were two keyboards, three guitars, at least five leads & backing singers, with a very excited, Sir Nose funkin’ it up on stage. I feel for the sound engineers. Surrounded by his family, George Clinton show his usual class. At 76 year old his energy and showmanship is as good as any younger artist. Surrounded by Trees and flags we discover the wonderful Troubadour Lula Pena at Yalumba Taste the World stage, blending fado music (also known as Portuguese blues), Cape Verdean morna with some French cabaret, Brazilian bossa nova. Her magnificent voice has the weight and depth of a ritual. One of the most talked about acts of the Festival was Hot 8 Brass Band, the New Orleans based brass band that blends jazz, hip-hop and funk styles with traditional New Orleans brass sounds. Their cover of Marvin Gaye’s ‘Sexual Healing’ was as expected, one of the highlights of the set. The audience was left with an impression that they’d just witnessed some of the coolest people on Earth patch together a kaleidoscope of amazing music. Seeing the octet walk around the crowds playing their instruments felt like being back in New Orleans carnival (if you ever been there). 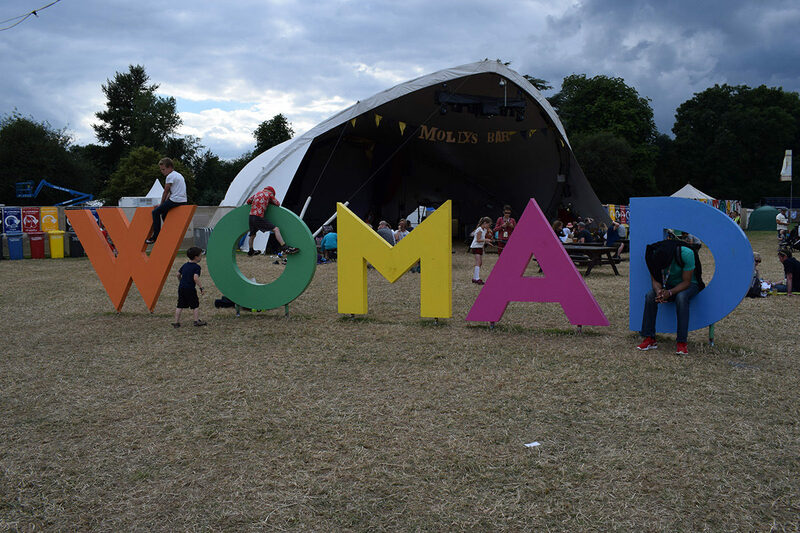 Womad is always exciting because it’s loved by an audience that now crosses generations, and it’s loved by the artists who respond to the setting and the audience, and make it a fabulous event. I can’t wait to return to my favourite festival!…In the meantime, check our photo gallery here.